Over the past year Colorado has made many transportation improvements along with various new proposals for future upgrades – some of which seem extremely futuristic. One potential upgrade is the Hyperloop. This futuristic, pod-based transportation system is a conceptual high-speed transportation system originally put forward by entrepreneur Elon Musk. It incorporates reduced-pressure tubes in which pressurized capsules ride on an air cushion driven by linear induction motors and air compressors. It will propel passengers at an average speed of around 600 mph with high speeds around 700 miles per hour making it the fastest way of travel – much faster than a flight or train. Colorado was named one of 10 finalists for the Hyperloop One competition and it’s proposed routes would stretch about 360 miles throughout the mountains and front-range. The Los Angeles firm, Hyperloop has moved into the next phase of the Hyperloop One competition. The company will further narrow down the candidates in the next few months. This major transportation investment could reach $24 billion. Hyperloop reportedly liked Colorado’s proposal so much, that it is working with the Colorado Department of Transportation to complete a feasibility study for the Hyperloop system regardless of the contest results. The Town of Breckenridge is working on a new parking structure located at the Tiger Dredge parking lot in Breckenridge. Construction for this project is expected to start later in the 2018 year. The new parking structure will add roughly 300 parking spaces near the Riverwalk Center. Early estimates put the cost of the structure close to $9 million. Breckenridge also opened the Four O’Clock roundabout in June which was created to ease traffic flow on Park Avenue. The Highway 9 expansion project also known as the “Iron Springs Realignment Project” was completed just in time for winter in 2017. The two-year project was one of Summit County’s more ambitious transportation improvements. 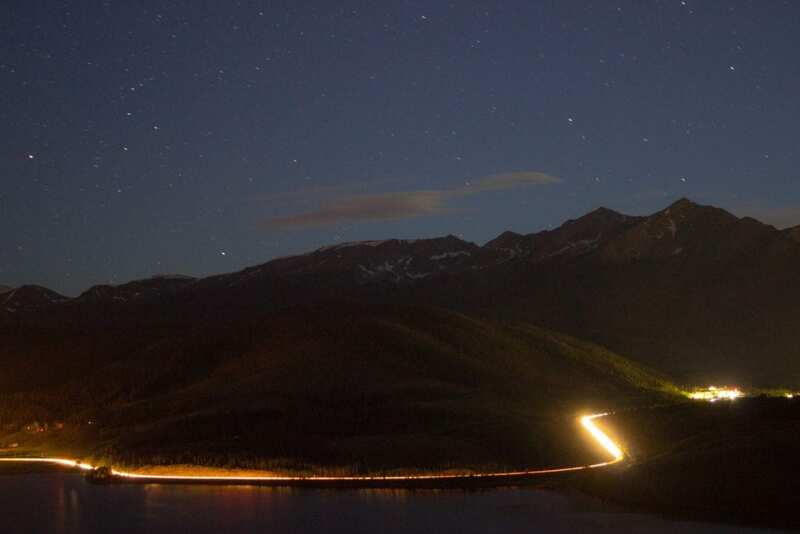 It converted the stretch of Highway 9 between Frisco and Breckenridge from two lanes to four and cut-out the hairpin turn known as “Leslie’s Curve” in the process. This project will cost roughly $23 million. Due to the budget of the Iron Springs Realignment Project, a small stretch of highway remains two-lanes. Thus more work has been slated on Highway 9. The project, known as “the gap,” would put a finishing touch on the Iron Springs bypass between Frisco and Breckenridge. This would establish four continuous lanes all the way from Interstate 70 to Main Street in Breckenridge. Funding isn’t yet final, but the CDOT has confirmed it’s one of 11 projects slated to receive money from a $1.9 billion funding package passed by the State Legislature last spring. $250 million for I-25 south of Denver: Construction of one new tolled express lane in each direction from Monument to Plum Creek Parkway. $200 million for I-25 north of Denver: Addition of one new tolled express lane in each direction, interchange reconstruction, mainline reconstruction, and improvements between state highways 402 and 56. $80 million for I-70 west of Denver: Construction of peak period shoulder lanes on the westbound side from Twin Tunnels to Empire Junction. $60 million for Highway 13 south of the Wyoming state line: Reconstruction and improvements at three locations between Wyoming and the town of Rifle. $57.3 million for U.S. 550/160 connection east of Durango: Completion of the connection at the Grandview Interchange. $55 million for I-70 east of Denver: Pavement replacement and associated safety improvements. $36 million for U.S. 50 west of Pueblo: Widening of the divided highway from two lanes to three. $25 million for Americans with Disabilities Act improvements around the state. $10 million for Highway 9 near Frisco (The gap): Completion of corridor including minimal widening, water quality and drainage improvements, and improvements to two intersections. $9.5 million for U.S. 50 near Little Blue Canyon: Reconstruction and widening of existing roadway to meet current design standards and improve safety, drainage and access. Project will also add passing lanes and do landslide mitigation. $9 million for U.S. 160 in Montezuma County: Construction of passing lanes and vehicle turnouts. For more information about any of these projects, please visit the Colorado Division of Transportation.